El Pinto restaurant opened in 1962 by Jack and Connie Thomas. They wanted to open a New Mexican restaurant serving the recipes of Connie's mother Josephina Chavez-Griggs. They decided to name the restaurant El Pinto or "the spot". It was a destination restaurant, but families came from miles around to have the delicious food and enjoy the beautiful north valley of Albuquerque. The Thomas' six children all helped in the restaurant while they were growing up. Their twins, Jim and John, took a particular interest and took over the family business in the early nineties. Jim and John worked on expanding the restaurant and creating a beautiful atmosphere while maintaining great food for all ages. 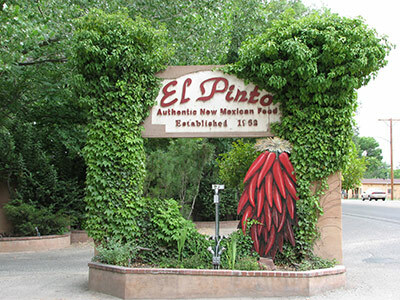 El Pinto is now the largest single restaurant in the state of New Mexico. The restaurant can seat over 1,000 guests at a time. It has become a must do activity for out-of-town travelers. On any given weekend there may be a wedding, corporate team building events, a movie that is filming, and friends and family enjoying a dinner out under the cottonwoods. In the late 1990's customers starting requesting that the salsa and sauces be bottled because of their great flavor. Jim and John worked through trial and error to get the best salsa and sauces they could in the bottle. They started a night shift at the restaurant to cook and bottle the salsa and sauces. El Pinto Foods began to take off and soon El Pinto Salsa and Green Chile Sauce were on local store shelves for people to use at home. El Pinto Salsas and Sauces are now available nationwide in stores including Wal-Mart, Kroger, Albertson's, HEB, and Costco.